Just like a mattress, your pillow is pretty much a personal choice. It might feel like you’re not investing as much money, but you are investing just as much in your overall comfort. In fact, it could be possible that you’ve just bought a new mattress and you still get those upper back, neck and shoulder pains. This might have nothing to do with your mattress, and it could have everything to do with your choice of pillow. This is why I have added a page with tips for choosing a pillow that will help you if you’re not sure what type of pillow you should be using. You can find it here. However, as is my way I couldn’t just leave it there so below you will find a few quick reviews on some of the best bed pillows I have come across. In case you hadn’t notice due to the description of this pillow, it is best suited to those of you that need a softer surface beneath your head. So, if you sleep on your back this one might be the answer to your dreams! It’s made from 50% white goose feather and 50% white goose down. The cover is 100% cotton and the feathers and down within have been cleaned using a CentroClean system which is why it’s hypoallergenic. If you prefer a fuller pillow that you can sink your head into, this is the one for you. Oh, and it’s available in various sizes, including Queen, King, 1 ‘8 x 22 inch and 2’ 2 x 22 inch. 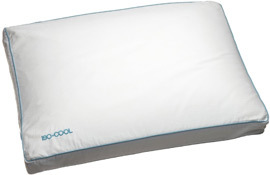 What I love most about this pillow isn’t just that you get the benefit of memory foam (my favorite as you probably know), but you get the benefit of Iso-Cool technology. If you’ve never heard of this before it’s the perfect answer for those of you who get hot overnight. It has something called PCM or Phase Change Material. This means it’s full of tiny beads that cleverly react to your body temperature. If you’re too warm, the beads absorb heat so you feel cool, and if you’re too cold it releases heat so you feel warmer (clever huh). 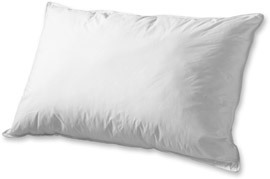 Aside from this great feature, you can buy this pillow in 3 sizes and all of them have a hypoallergenic cotton cover that can easily be removed using the zipper. Do bear in mind however, that because this pillow has memory foam it can feel firm so it’s probably better for side sleepers. Right, I’m moving back to soft pillows, but for this one you’re in for a treat! Royal Hotel has created one of the most luxurious pillows you can buy, and it’s full to brimming with hand plucked white goose down. All of the down used is bacteria free and to finish the whole thing off you have a cover made from 100% Egyptian cotton complete with double silk piping. This may not be the cheapest pillow on the market, but you get two for the money, and personally I think they make the perfect gift because the packaging is something to behold on its own! You can buy them in King and Standard sizes, but do bear in mind that even the standard size is pretty huge due to the amount of goose down used by the manufacturer. If you like big, soft but not too soft pillows and feel like treating yourself or someone special, these pillows should be on your shopping list! Ok, so this is “just” a cover and not a pillow, but considering its functionality I just couldn’t leave it out. For this one I have people who suffer from allergies in mind, and I also think this model is perfect for children. 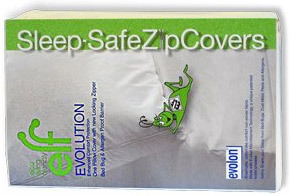 The Safe ZipCover uses EVOLON fabric which has been awarded the Seal of Quality by the ECARF (European Centre for Allergy Research Foundation). This pillow cover is engineered in Germany under the strictest of regulations and has been medically proven to protect from mites. It will also stop those bed bugs from biting and dust mites will be a thing of the past as well. In fact, if you’re someone who dreads all that sneezing, blocked noses and runny eyes overnight, I think this cover is definitely worth a look. The price will surprise you as well! If you’ve been looking for a pillow that will help to support your neck and you sleep on your side or back, the chances are some of the big brands are just too much for your budget. That’s why I decided to include this model from Sleep Innovations. It has been specifically designed to help those of you who suffer from neck and back pain due to poor support from your current pillow. The shape is contoured so that when you lie on it, your spine is properly aligned depending on the position you sleep in. It uses SureTemp memory foam and the cover (which can be removed for washing) is made up of 80% cotton and 20% polyester giving it a velour feel which is soft to the touch. 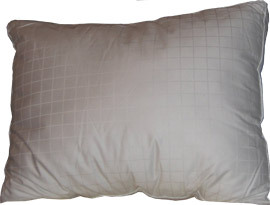 This pillow also includes a layer of cooling foam so you don’t overheat during the night. What I will say is this pillow can take some getting used to because it’s pretty firm, and the shape isn’t anything like a standard pillow. Oh, and you can buy it in Queen or Standard sizes. 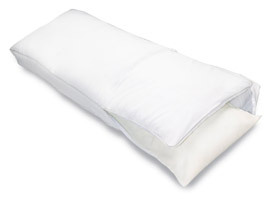 This pillow is not advertised to help with additional support so if you’re looking for something because of your aches and pains, this might not be the answer. However, if you suffer from allergies, it’s a great buy! The whole pillow (which I know interests many people) is made in the USA and it comes with a 3 year warranty, plus a 100% money back guarantee. The outer layer is 100% cotton and on the inside you benefit from siliconized cluster puff fiber. This gives the pillow an overall feel of “fluffiness” yet it’s not too soft and is the perfect alternative to the more expensive down pillows. Due to the fibers on the inside, unlike many other brands this one shouldn’t lose its shape and in fact the manufacturer boasts it will last anywhere from 3 to 5 years. The whole pillow is machine washable and it’s available in a good many sizes including Queen, King, Jumbo, Standard, Baby and Body. Have you ever been to a hotel and thought “wow, that pillow was amazing”? Well, this one from Pacific Coast is probably the closest you’ll get! What I like most about this model is it’s like a “pillow within a pillow”. Let me explain. Basically, it’s made up of 95% natural duck feather which has been hyper-cleaned and 5% natural duck down which has also been treated. The down surrounds the feathers within, which results in a pillow that’s soft enough for your head to sink into, but is firm enough to offer you support. 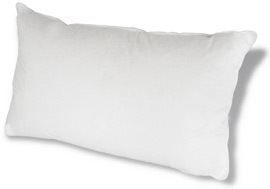 If you’re worried about allergies, this pillow can help as well. 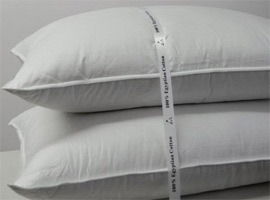 Hyper-clean technology means that all dust, dirt and allergens have been removed, and the outer AllerRest fabric prevents these particles from invading the pillow. The only comment I will make is this pillow is thick so if you prefer a flatter surface, maybe one of the other models I have here will suit you better. Plus, you should be prepared to give it a good old “fluff” every morning so it returns to its original shape. OK, so we all want the best when it comes to the perfect pillow, but paying the prices asked for the most natural and luxurious materials isn’t possible for everyone. You may also be reading this little review and wondering when your search for the perfect pillow at a price you can afford will ever end! Well, if you’re a notorious stomach sleeper, this model might not do it for you (sorry), but the reason for this is it is quite thick and can feel pretty soft. 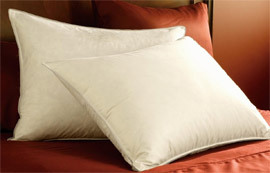 This pillow uses 100% hypoallergenic Microfiber which has the feeling of down without the price tag. Due to the material used you can put the whole pillow into a washing machine (on a low temperature) and it won’t become lumpy or take forever to dry which makes it pretty convenient to keep clean. It comes with a 1 year limited warranty and you can buy it in Queen or Standard sizes. Just be prepared (like the one above) to fluff it up the next morning. So, if you’ve read some of the reviews above and you prefer a firmer pillow, I can forgive you for thinking I’ve left you out! If you do fall into this bracket of “sleepers”, I chose this model from Z® by Malouf just for you. Like many of the memory foam mattresses I have reviewed, this pillow uses open cell technology which makes it durable yet “moldable”. Although I would put this pillow in the “firm” category, it doesn’t feel like rock when you lie on it, and it’s received very favorable comments about how quickly it returns to its original shape. The foam used is antimicrobial and resistant to dust mites and other allergens plus, you get a removable velour cover. Unlike a lot of models of pillow I have come across, this one isn’t just available in different sizes, you can also buy it in high or low loft. If you’re interested, the sizes available are Queen, King and Standard. I grapple with finding pillows (or mattresses for that matter) that will suit all types of sleeper, so I was pleasantly surprised when I came across this body pillow from Sleep Innovations. The manufacturer does advertise it as a medium to medium firm feel but it will help back, side and front sleepers feel much more comfortable overnight. They have used both SureTemp open cell memory foam and gel memory foam. The first is great for additional support and airflow whilst the second is perfect for keeping you cool by minimizing heat build-up. Other benefits are the 1 year limited warranty, removable cover and mite and allergen free foam. The only one point I will make is (due to the size) this body pillow is heavy so it might be wise to think about a permanent position for it.